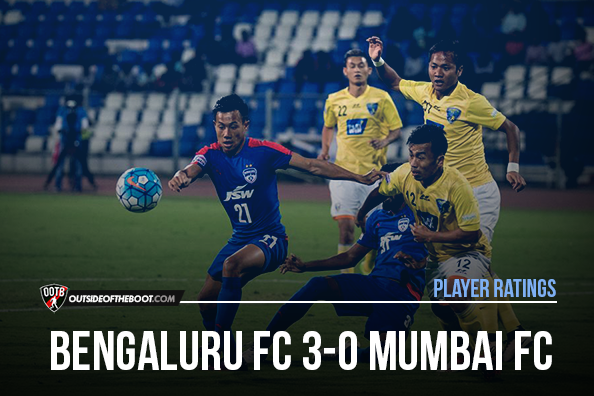 Arnab Ray gives his Player Ratings for Bengaluru FC’s comfortable win over Mumbai FC. With both sides coming into the game on the back of consecutive victories, the stage was set for an intriguing encounter between Bengaluru FC and Mumbai FC. The first half was a tightly fought affair but in the end CK Vineeth’s superb hat-trick meant that the home side came away with 3 important points. Amrinder Singh — 6: The Bengaluru custodian had another quiet night as Mumbai were toothless in attack. The only real test on the night was when Amrinder had to get down low to his left to save Reagan Singh’s shot from distance. The 23-year-old will be a bit disappointed with his distribution which was scratchy in the first half as Mumbai pressed the home side in their defensive third. Harmanjot Khabra — 7.5: The versatile Khabra put forth another solid display from right-back. 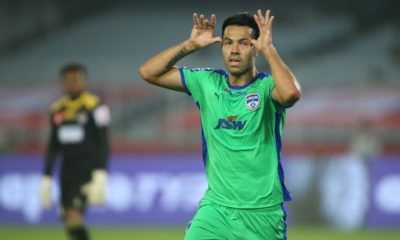 Khabra has formed a good partnership in attack with Udanta Singh and was a crucial aspect in the Champions’ build-up play with two assists to his name. The 28-year-old did have a couple of nervous moments defensively courtesy Thoi Singh but will be pleased with his performance nevertheless. John Johnson — 7: The former Boro man was his imperious self once again as he marshalled the defence expertly. Aided by a well organized side in front of him, Johnson was at his combative best as he and his defensive counter-parts kept Victorino Fernandes quiet throughout the game. A yellow card in the first half was the only blemish in the Englishman’s performance. Juan Antonio — 7: Having been signed by Albert Roca to replace Curtis Osano, the composed Juanan did his job with minimum fuss. There will be games in which he’ll be more strenuously tested but for now the Spaniard is settling into the I-League well and has already struck up a good partnership with Johnson. Nishu Kumar — 6.5: After an underwhelming performance from Sena Ralte last time around, Roca chose to rotate his squad and young Nishu Kumar was drafted into the line-up to feature at left-back. The youngster did his reputation no harm in the latter stages of the AFC Cup last season and it was more of the same against Mumbai. The left-back was tidy on the ball preferring to keep things uncomplicated and acquitted himself against the veteran Steven Dias. Cameron Watson — 7.5: Having missed out on his services last weekend against Chennai, Roca would have been glad to call upon Watson again this past gameweek. The Australian is vital to the Blues’ first phase of build-up play as he drops in between the centre-halves and initiates play out from the back. The 29-year-old is an excellent reader of the game and is also very vocal on the pitch. Watson also got himself an assist as he set up Vineeth for the first goal of the game on the stroke of half time. Lenny Rodrigues — 6: With Watson acting as a security blanket, Lenny Rodrigues’ contribution to the team comes mainly in adding a man to Bengaluru’s pressing scheme. The energetic midfielder’s industry is certainly useful and his willingness to tackle, especially to stop counter-attacks, adds steel to the midfield. The Indian International will have to improve his composure on the ball though as a number of loose first touches led to potential chances for Mumbai. Udanta Singh — 7: Long heralded as one of the brightest young talents in Indian football, Udanta has started the I-League campaign in fine form. The U-22 player continued in the same vein as he was a constant thorn in the side of Mumbai’s defence. The winger dovetailed nicely with Khabra as the duo formed the primary attacking threat for the home side with all three goals originating from the right wing. 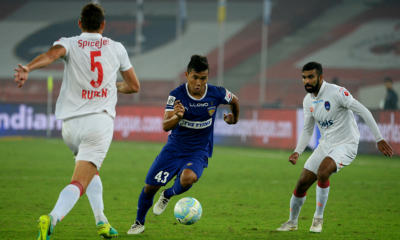 Eugeneson Lyngdoh — 6.5: Such are the lofty standards that Eugeneson Lyngdoh has set in his time at Bengaluru, that one expects him to run the show every game. The 30-year-old has had a quiet start to the season thus far but has still been contributing to the team’s cause. Given a free attacking midfielder’s role, Lyngdoh showed good movement throughout the game and almost got on the end of Watson’s lofted pass early in the piece. Sunil Chhetri — 6.5: Much like Eugeneson, Chhetri’s start to the campaign has been on the slow side. The Bengaluru captain’s work rate throughout the game was phenomenal and there were a couple of trademark, mazy runs and assured touches that we’ve come to deem par for the course when it comes to India’s most high profile player. CK Vineeth — 9: Coming off the bench to seal the win against Chennai City the past weekend, Vineeth was rewarded with a start and made the most of it. The man from Kerala sealed what is the first hat-trick in the club’s history as he put the Mumbai defence to the sword. Vineeth didn’t have much to feed off in the first half but was in the right place to break the deadlock on the stroke of half time. 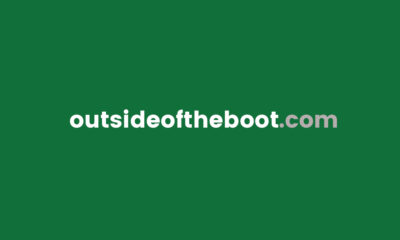 In the second half, the fan favourite turned on the style first exhibiting textbook movement to get on the end of Khabra’s cross to score his second before scoring a sumptuous third goal with a sharp turn and finish. Roby Norales – 6: Roby Norales was used from the bench once again, this time getting a longer run-out as he replaced Udanta. The Honduran striker played on the right side and struggled to carve out a real chance for himself. It didn’t help that the home side appeared to take their foot off the accelerator a bit as they eased to a 3-0 victory. Alwyn George – 6: Alwyn George came on for Lyngdoh for the last quarter of the game. The attacking midfield role is probably one that suits Alwyn the best and he showed glimpses of his sublime technical ability while on the pitch. While neat and tidy on the ball, it would be surprising to see the midfielder make the starting line-up against East Bengal. 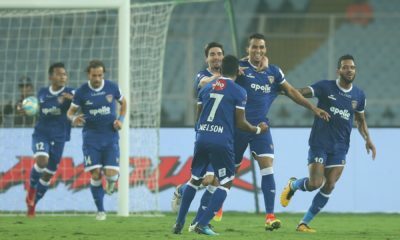 Sandesh Jhingan – n/a: Much to the delight of the West Block Blues, Sandesh Jhingan came off the bench to make his debut for the I-League Champions. Slotting in at right-back, Jhingan made a couple of sturdy tackles and looked comfortable in his short debut.